Design almost anything in 3D with SketchUp Whether you've dabbled in drawing in 3D or are interested in learning the basics of design, SketchUp For Dummies makes it fast and easy to learn the ropes of a powerful, user-friendly tool to bring your design ideas to life. 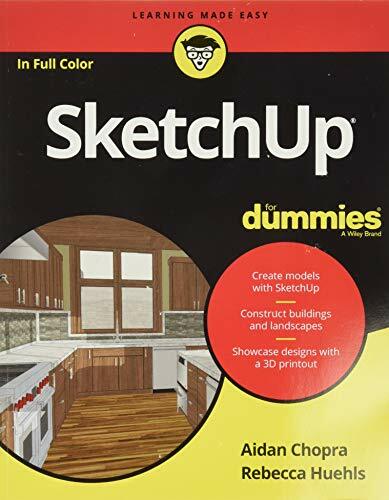 Design almost anything in 3D with SketchUp Whether you've dabbled in drawing in 3D or are interested in learning the basics of design, SketchUp For Dummies makes it fast and easy to learn the ropes of a powerful, user-friendly tool to bring your design ideas to life. From creating a basic 3D model to showing off your work via 3D print or animation, this all-access guide pulls back the curtain on using SketchUp to do anything from redesigning your house to mocking up the next great invention. With an emphasis on usability, SketchUp has found very wide success as a tool even non-designers can use to make basic drawings. And now, thanks to the insight and expert tips from former SketchUp product director Aidan Chopra and co-author Rebecca Huehls, this easy-to-follow guide makes it more accessible than ever! * Create buildings and components * Alter the appearance of your model * Tour your designs via SketchUp * Get quick tips on troubleshooting If you're a designer with sketchy computer modeling skills, SketchUp For Dummies is the trusted reference you'll turn to again and again.